SCROLL DOWN TO WATCH MY MUSIC VIDEO COLLECTION! Adrian Star appears on the soundtrack to his latest feature film "Hello, Are You There?" set in 1989 by contributing the song "On The Run" and composing the classical score. Adrian wrote, directed, & starred in the movie as well. You can listen to a sample of the full soundtrack and get it HERE. Movie trailer is also posted. Announcing a new Adrian Star album in the works. "STARGAZING" is an album of other artists doing contemporary styled cover versions of Adrian Star songs. If you're an artist interested in contributing a track, please contact me at the bottom of this page. Adrian's new short film/music video for "CRIMES" is now live & posted below. It has been selected for several film festivals. Listen to album samplers below by starting the appropriate player underneath the album covers. If you like what you hear, you can instantly order the album via digital download at 1/2 price by selecting the album cover image. You can also stream full albums at BANDCAMP. Audio players below are segments containing Adrian Star's music on various radio podcast shows. Adrian Star is a 1980's anachronism in music. His synth-pop sound is influenced heavily by genres of the '80s such as New Wave, Top 40 Pop, and R&B Dance. He uses vintage synthesizers and older analog recording equipment to achieve his signature sound. He does not use "soft synths" (software/virtual based instruments). He plays his basslines & melodies humanly on actual keyboards and uses real saxophones & guitars. No auto-tune vocal technology is used on his songs. Adrian does not compete in the loudness wars when mastering his music. He keeps the dynamics of the song in place '80s style rather than a constant "everything the same" philosophy. He sticks to his '80s guns for his music videos as well. ​Lately, Adrian has been on the bill with legendary pop/new wave acts such as Berlin and Missing Persons. 1986 era Stealing Sunrise and 1995 era Stealing Sunrise 2: Malibu Trail. 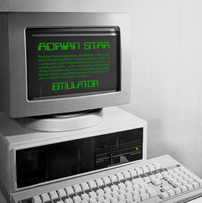 Adrian has released 3 albums to date, EMULATOR (2014), EMULATOR II (2016), & EMULATOR II+ (2018). HELP ADRIAN STAR GROW WITH THIS SURVEY!